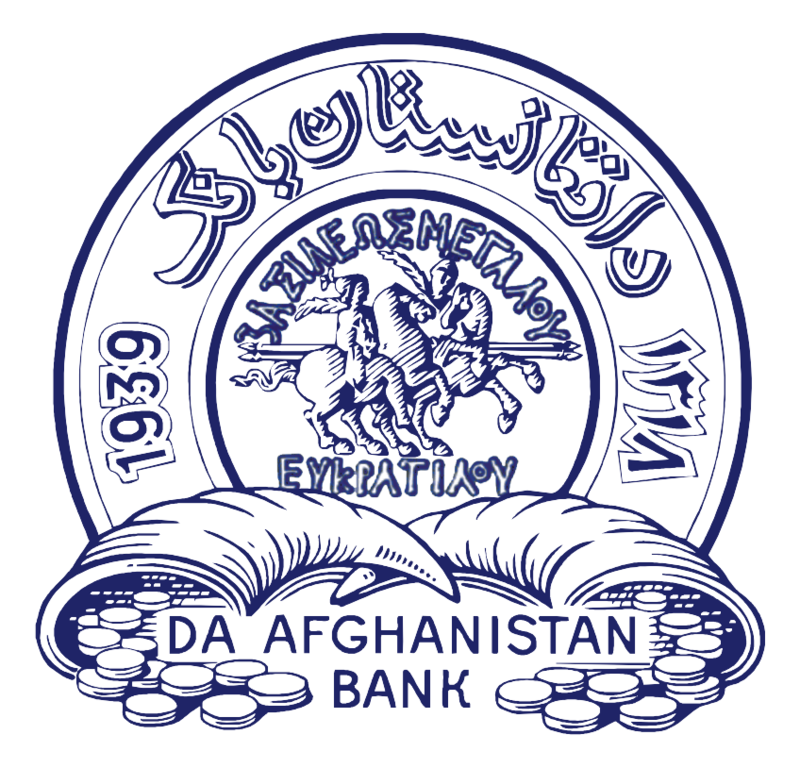 Da Afghanistan Bank’s logo has been designed in two circles. In the first circle, the name of Da Afghanistan Bank in national language has occupied one third part of the space with the date of its establishment in both solar (1318) and Christian (1939) years on the two sides. In the bottom of the circle, there are two cow horns with coins spilled out of it that symbolizes how the money was protected in the ancient. In the second circle drawn within the first one, an old historic coin is embedded. This old coin was discovered from the ruling territories of Bakhtarids (present day Balkh province) which circulated as means of exchange in the periods of Eukratides. According to Afghanistan National Museum data, the coin which bears a rich and deep-rooted cultural history, has been discovered in Qala-e Zal area which reveal that the monetary system has long existed (over two thousand years ago) in these territories and coins were used in daily exchanges. The coin portrays two men on two horses with two lances in hand that appear to move forward. These two horse riders are two brothers – Kastor and Pollux – wearing cone-shaped hats each of which are topped with signs of star that represent Mithraism, perhaps, belonged to ancient Aryans. On the top of the illustration, “Eukratides” is carved half-circle shaped which delivers the meaning of “Mighty King”. The silver coin centered in the logo has been adopted since solar year 1358 that represent the cultural symbols of Yunanu Bakhtarids. The (Greek) character used in the coin is an evolved Arami character which was commonly used during eras of Kushanids and Sasanids in the territories of Bakhtarids.